Yes you read that right! 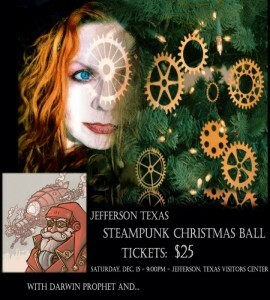 This year a Steampunk Christmas Ball event will be held in our East Texas town of Jefferson. Featuring the music of Darwin Prophet and others yet to be determined. We will keep you posted when we know who else is coming. 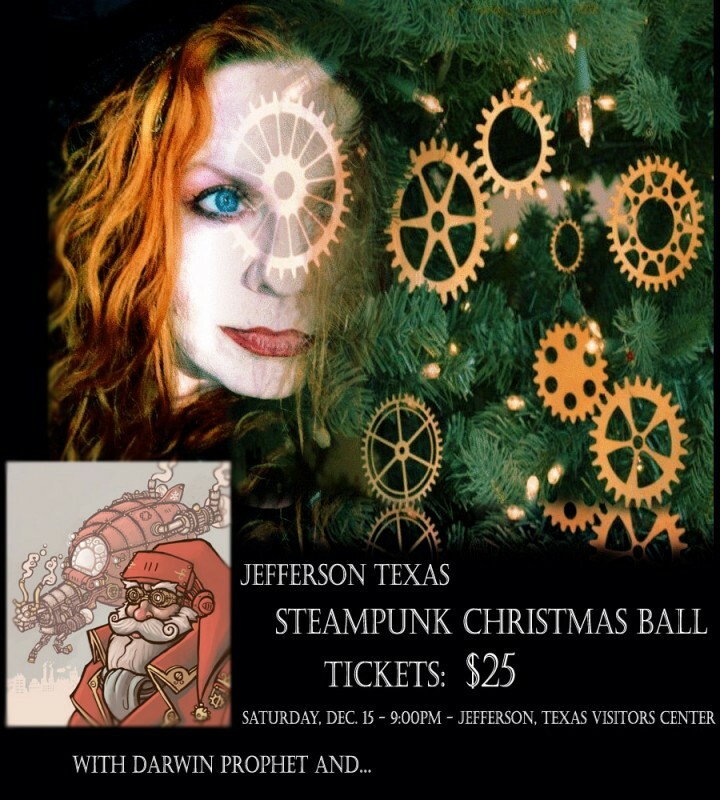 Jefferson is a perfect fit for a Steampunk Christmas, we have the Jefferson Railway steam train rides, the Graceful Ghost steam powered boat rides on Caddo Lake and an abundance of antique shops in which to shop for the perfect accessory for your outfits. One shop in particular sells clothes for all types of Vintage clothing, visit the Fashion and Art Revival or give Ellen a call she can help you with ideas for the best outfits. Interested in learning more about Steampunk? This past spring Jefferson hosted a Steampunk conference, I wrote more about the society here. One of our local Jeffersonians who recently adopted the love of Steampunk wrote: “A huge part of Steampunk attitude has to do with re purposing (recycling) old stuff. An old chandelier can become a hat, or a weapon!” It is a perfect description. The Ball is scheduled for Saturday December 15, 2012 at 9:00 PM at the Jefferson Visitors Center. You can buy your tickets online here. Be sure to book a room at our East Texas bed and breakfast early because rooms will go fast during the holiday season. This entry was posted in Christmas, Special Events, Winter Attractions by Tammy D. Bookmark the permalink.